You may have heard horror stories about how bankruptcy destroys your credit and that you will lose everything you own if you file. Thankfully, these myths are not true. While it is true that filing bankruptcy will have an effect on your credit and you may have to sell some of your property, it is not nearly as terrible as some might let you think. In fact, for many people, it can bring relief and a fresh start after years of living in the red. Bankruptcy is supposed to provide the honest but unfortunate debtor with an opportunity to start fresh with little to no debt. It helps those who have gotten in over their heads with debt for a variety of reasons. Financial struggles affect everyone at some point. Bankruptcy is often the result of just one or more negative events in your life. For many, it has nothing to do with buying extravagant things that you cannot afford; it is much more likely to be due to job loss or a health condition. Don’t feel bad about considering bankruptcy—these situations are exactly what bankruptcy is for! Many people cannot get past the negative stigma that is often associated with bankruptcy. They assume that filing for bankruptcy means that they have failed as a planner, budgeter, or even as an adult. This is not true! The bankruptcy system was designed to be used. The automatic stay. If you are on the brink of losing your home, car, or even being evicted from your apartment, filing bankruptcy can give you more time to organize your finances so you can keep these items. The automatic stay goes into effect the second you file, which means it stops collection efforts, lawsuits, garnishments, repossessions, and more. Repairing your credit over time. Although your credit will take a hit when you file, those who filed bankruptcy and addressed their outstanding debt actually have better credit than those who continue to struggle with paying off creditors for the years that it takes to fully address your debt. Reduced stress and higher income. 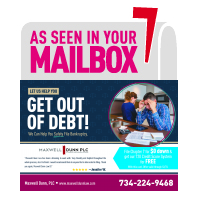 When you discharge your debts, you no longer have to deal with phone calls from creditors, being nervous about opening your mail, or constantly using all of your paycheck toward bills. For many, the decreased stress of filing bankruptcy is well worth it. You will also likely have higher discretionary income after you go through the process, which means more money for your daily living expenses. Perhaps the biggest benefit is that you can put your debt behind you and move on. You can start fresh, which is exactly what the bankruptcy system is designed to do. If you want to learn more about potentially filing for bankruptcy, talk to our team. Set up an appointment by calling (248) 936-6390.